Blogger Event Sign Up: Crazy Dayz of Giveawayz--Bloggers get a $20 Target Gift Card! Bloggers, are you looking for a great event to promote your website? Look no further! You can sign up for only $5 and you get a $20 Target Gift Card for any other bloggers you refer!!! Please sign up and say that Why We Love Green referred you! 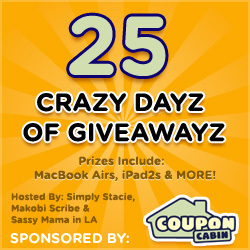 CouponCabin’s 25 Crazy Dayz of Giveawayz is hosted by Simply Stacie, Makobi Scribe and Sassy Mama in LA and sponsored by CouponCabin, a leading online destination for coupons including coupon codes, printables, grocery coupons and more. Not only will each blogger who joins be eligible for the Blogger Prizes, they will also receive one (1) $20 Target Gift Card for every blog they refer who registers to participate in the event. Please note you cannot refer yourself. CouponCabin will send the Target Gift Cards at the end of the event in November. Sign up on the form HERE and send a $5 administrative fee (non-refundable) via Paypal to SassyScorpYM@gmail.com. Make sure to say that Why We Love Green referred you! Since this event is sponsored by CouponCabin, your giveaway sponsor for this event should not be in direct competition with them (ie. another coupon website). Blogger & Reader Prizes are open to both US & Canada. Sign ups are now open! Please fill out the form (and say that Why We Love Green referred you!) and submit your non-refundable administrative fee of $5 to SassyScorpYM@gmail.com You will be emailed within 24 hours to confirm your participation. Then please spread the word!